Elaine Russell earned a Master of Music degree and became a professional singer in New York city for many years. Elaine's interest in CranioSacral Therapy, a subtle healing technique that works on the brain and nervous system, relaxing the core and releasing physical and emotional restrictions, led her to take seven levels of training in CranioSacral and SomatoEmotional Release including the advanced Brain Work, six levels of training in Visceral Manipulation, and a training in Process Acupressure from the Upledger Institute. She was also certified at the Vodder School of Manual Lymph Drainage. Elaine integrates BodyTalk into her sessions. It is a healing energy work that treats all elements of the bodymind, and spirit, past, present and future. Elaine is a Certified BodyTalk Practitioner, has completed seven levels of training, and is qualified to do non-local healing sessions. 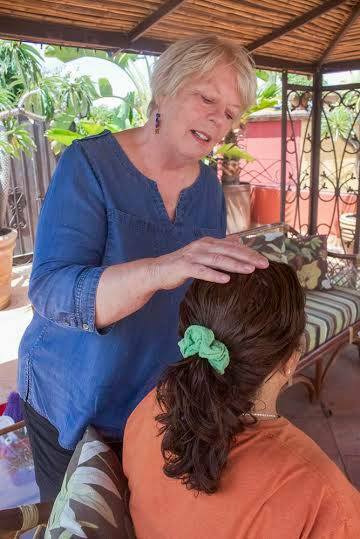 She uses the feedback of kinesiology to discover the most appropriate modality for the person in their treatment. Elaine combines understandings not only from these trainings, but also from her affiliation with Pir Vilayat (she was initiated into his Sufi healing order) and Osho (she was initiated and studied in several of his groups), the great teacher Marshall Rosenberg (Compassionate Communication) and her certifications in NLP and Ericksonian Hypnosis. She is certified in EFT (Emotional Freedom Technique) and has studied Ayurveda and its subtle understanding of the makeup of the body/mind. "A true healer does not heal you; she simply reflects back to you your innate capacity to heal. She is a reflector, or a loving transparency. "Un verdadero sanador no le cure; ella simplemente refleja de nuevo a usted su capacidad innata para sanar. Ella es un reflector, o una transparencia de amor. Un verdadero maestro no te enseña; ella no te ve como intrínsecamente separados de ella, o menor que ella. Simplemente se refleja de vuelta a su propio conocimiento interior, y le recuerda de la inmensidad de su ser. Ella es un espejo, un poste indicador. Y el amor es el espacio en el que todo esto es posible; El amor cura, y se aprende mejor en un campo de amor, no hay amenaza de fracaso, sin castigo ".